The Polycrete® system performance is way beyond conventional approaches. The structure and the insulation are done at the same time with one product. 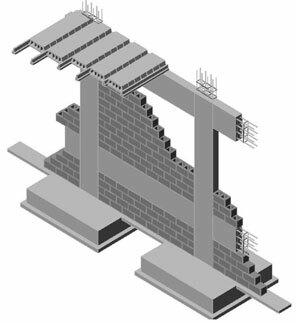 Many construction steps are needed to build the columns and beams, to fill walls with concrete block and to do the insulation. Moreover, those extra steps increase the needed labor, the construction time frame and construction costs. 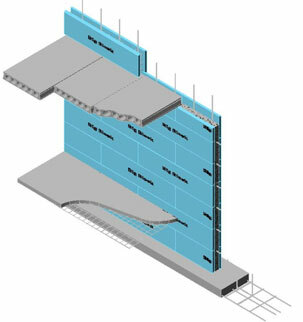 Structure of reinforced concrete built with insulated concrete forms. Also, the structure is built on a continuous reinforced concrete footing and there is a uniform distribution of loads. The walls are load-bearing ones. Installation is fast and easy with less labor involved. Structure made of columns and beams with point charges. The walls are filled with concrete blocks. Insulation is done separately leading to additional costs of both labor and material without achieving the level of performance of Polycrete® walls.